"An Image I Love", a very self-explanatory title. This post went down extremely well last month so of course I couldn't go without a issuing a second insight. 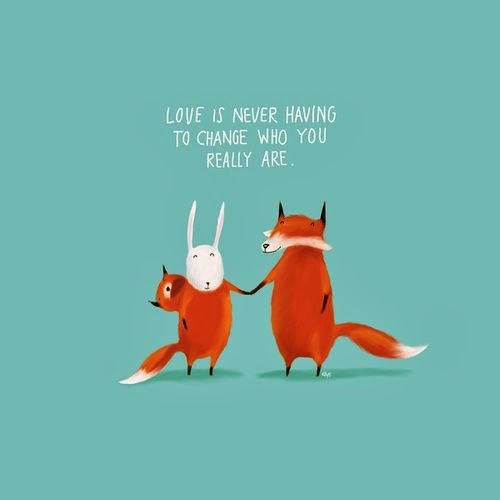 "Love is never having to change who you really are." Many of us feel like if we changed in certain ways, we'd be more liked and loved by others, when the truth is if someone doesn't like you as you are then they don't deserve you in the first place. Whether you want to be loved by friends, family or a special someone, you should be loved for being you! You shouldn't have to loose weight, cut your hair, laugh differently, go to college or do anything you don't really want to do, just to be liked or loved by someone. If anything you should emphasise the true you as long as you're happy and healthy, whether that involves getting a nose piercing, wearing pink tights, eating a large hamburger, if that's what you want to do and it doesn't harm you, then what is the big deal? Someone will love you no matter how you laugh, what you wear or where you work because it makes you an individual.